Recent online discussion illustrated and recommended a 40m dipole strung on a timer fence at a height of about 1.5m to a new ham with a 10W power limit in search of good solutions from ‘experts’. At 40m, if you have a 10W limit and little knowledge and experience, the simplest objective is to radiate MOST of your 10W in the hope of being able to sustain some contacts and join the community. At the same time, you want to separate your antenna from your own and your neighbour’s house wiring, TV antenna systems etc to minimise noise pickup from these very local sources and to reduce the risk of interference to other systems. In the very near field zone, small increases in separation achieve large reduction in coupling. Radiation efficiency is a quantitative measure, it means TotalPowerRadiated/RFPowerInput. It can be presented in deciBels as 10*log(TotalPowerRadiated/RFPowerInput). No antenna system is perfect, and some loss must occur in matching devices (ATUs), feed lines, antenna conductors, and ground. The quest is to manage these losses to acceptable values, especially where available power is low. 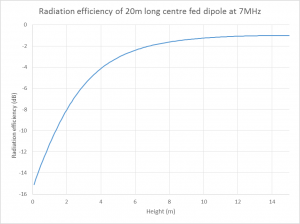 Radiation efficiency for practical HF antenna systems commonly ranges from around -1dB to way less than -10dB, but for a practical half wave dipole at a reasonable height on 40m, entire system (ie including feed line etc) radiation efficiency should be greater than -2dB. 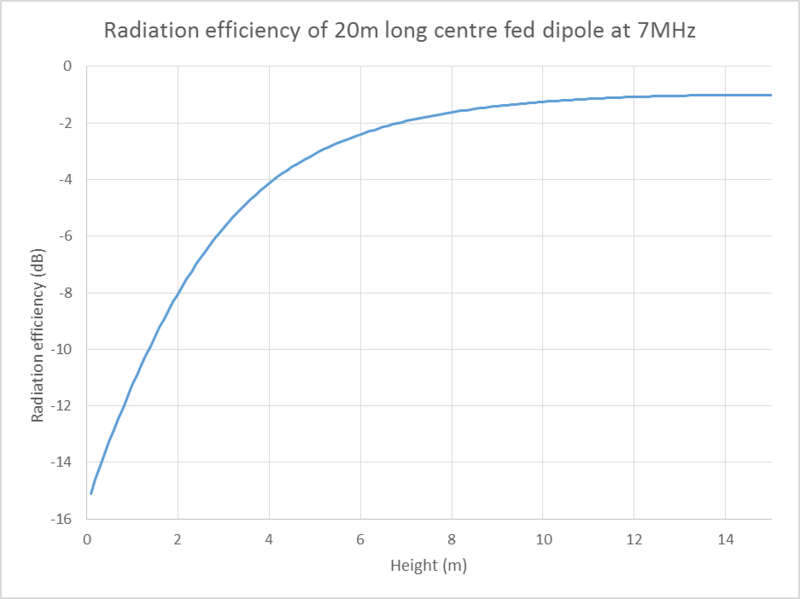 Above is a plot of radiation efficiency for a 20m long dipole of 2mm copper conductor at various heights above ‘average ground’ derived from NEC-4 models. The model includes antenna conductor loss and ground loss, and results are dependent on the assumptions about ground conductivity and permittivity. The loss in the copper in this instance is very small, <0.1dB. Maximum efficiency of -1.0dB (79%) occurs at about 15m, and it is still quite good down to about 5m (-3.1dB), but then falls fairly quickly with decreasing height. Below 3m height, reducing height by 1m costs about 3dB in EIRP. A quick inspection shows that the efficiency of the dipole at fence height (say 1.5m) is -9.5dB (11%), 8.5dB lower than the efficiency at 15m height. People might talk of a dipole at this height being a cloud warmer, but they are quite wrong, almost 90% of the RF power delivered to the dipole heats the soil. The graphs explains why it IS possible to have DX contacts with the dipole lying on the ground, but you will have more contacts with the dipole at greater height. There is an apparent readiness for hams with the least available RF power to squander it. Inefficient ATUs, inefficient feed systems, small diameter antenna conductors (so-called stealth antennas), poor conductors (eg stainless steel) and antennas low to the ground are common features of low power stations.